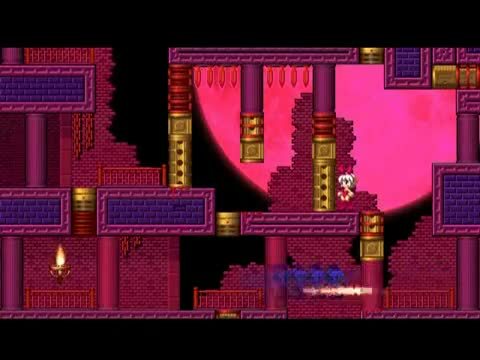 Teaser video - Bunny Must Die! Press Pause Radio: "The gameplay itself is fluid, and the control is impressively tight. Bunny has all kinds of techniques that are gradually learned throughout your adventure. You'll be able to choose between original and remixed visuals as well. Finally, the soundtrack is pretty amazing, with lots of super-catchy tunage and the option between the original and remixed soundtracks. It's going to be pretty hard for any action gamer to not find something they like in this package." Joystiq: "Bunny Must Die: Chelsea & the 7 Devils is an "exploration-based platformer" due this summer, in which a bunny-suited girl explores the "Devils' Labyrinth," picking up additional weapons like the "Hyper Heels," getting through traps, and solving puzzles. Bunny also gets time manipulation powers, allowing her to slow, stop, or reverse time." Mash Those Buttons: "Bunny Must Die is a 2D action platformer that makes it easy to reminisce over old school games from your childhood. With Castlevania style gameplay, stages in the form of Metroid labyrinths, and Mega Man style boss battles there’s little that players won’t enjoy. The visuals are smooth and very much like those of an anime, giving the players a very warm feeling as they scour the bowels of the devils’ dens."